From left to right: Spencer and Tanner Harrison, the CEOs of Campfire Industries; Maura Donohue, U.S. Chamber board member; Rachel Zietz, CEO of GladiatorLacrosse; and Brandon Boynton, CEO of MostBeastlyStudios. Photo by Ian Wagreich. Four young entrepreneurs pitch their businesses to members of the U.S. Chamber of Commerce and its foundation. Four of America’s top young entrepreneurs came to Washington, D.C. on June 17, to pitch U.S. Chamber and U.S. Chamber Foundation leaders on their business success and compete for grants. The four CEOs—all in high school—are graduates of YEA!, a program that teaches middle and high schoolers how to build and run a business. The Chamber Foundation began partnering with YEA! in 2011 and has driven growth to 117 chapters in 38 states. The contestants launched their businesses through YEA! in 2013 and 2014, and have seen their companies grow rapidly. Pete Snyder, CEO of Disruptor Capital, hosted the pitch presentation and gave the students a tight four minutes to introduce their products and business plan. The audience then voted for where they would most likely invest. 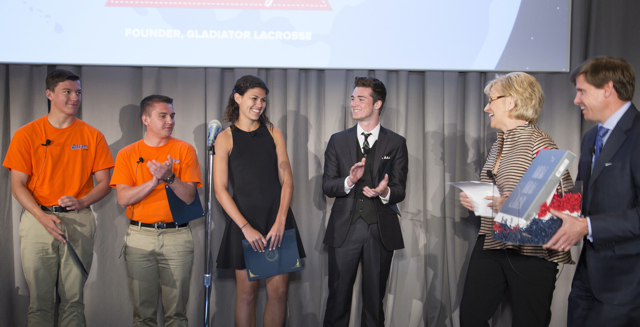 Rachel Zietz, the CEO of Gladiator Lacrosse, received the top prize. Runners up Brandon Boynton of MostBeastlyStudios; and brothers Tanner and Spencer Harrison, co-founders of Campfire Industries, also went home with grants. The entrepreneurs also became the newest members of the U.S. Chamber of Commerce Small Business Council. The students showed that the YEA! program is much more than an afterschool activity. They have been active CEOs and job creators with aggressive plans for growth. As a seventh grader in Boca Raton, FL, Zietz was unhappy with the quality of her lacrosse practice equipment and set out to create a better model. Two years later, the rising 9th grader said she expects Gladiator Lacrosse to pull in more than $1 million in revenue in 2015. Her line of lacrosse training equipment, including rebounders and goals, is a top seller on Amazon.com and eBay, and Zietz is actively working to expand the company’s retail presence. Boynton, a 17-year-old from Indiana spoke passionately about how personal experience being bullied led him to focus on his gift as an app developer. His signature app, Bully Box, allows anonymous reporting of bullying and other dangerous activities in schools. He reported that there have been thousands of downloads. “I became determined to provide a mobile application that would provide a voice to students that were in need of help,” Boynton said. In addition to the Bully Box, Boyton is developing several newer apps including The Curfew Buddy, a helpful tool for parents; and Forgetmenot, a gravesite finder. “I want to make a difference, and look forward to the day when I can be like you, support aspiring entrepreneurs,” Boynton told the crowd. Avid campers and Eagle scouts, brothers Tanner and Spencer Harrison of Utah wanted to create the perfect campfire dessert. Their Wolf ‘em Stick— manufactured entirely in Utah—is a marvelously simple rotary cooking device that allows anyone to make tasty campfire desserts from biscuit dough. The brothers have sold more than 9,000 sticks, and they now available in 102 stores. The Harrisons are anticipating more than $400,000 in sales by 2017. “We combine our favorite things—fire, fun and food—into our product,” Spencer Harrison said. All four CEOs also received a year’s subscription to the Wall Street Journal and a workshop with experts from CRAFT, a public relations and digital marketing firm. The YEA! program continues to roll out in communities across the country. The 2015 program culminated at the US Chamber of commerce small business summit earlier in June, where six young entrepreneurs competed for college scholarships and other prizes. The winner: Thirteen-year-old Kayla Abramowitz, the founder of Kayla Cares4Kids, a non-profit that collects and donates entertainment and educational materials at hundreds of children’s hospitals and Ronald McDonald houses in 45 states.